The Ripley, Revealed! 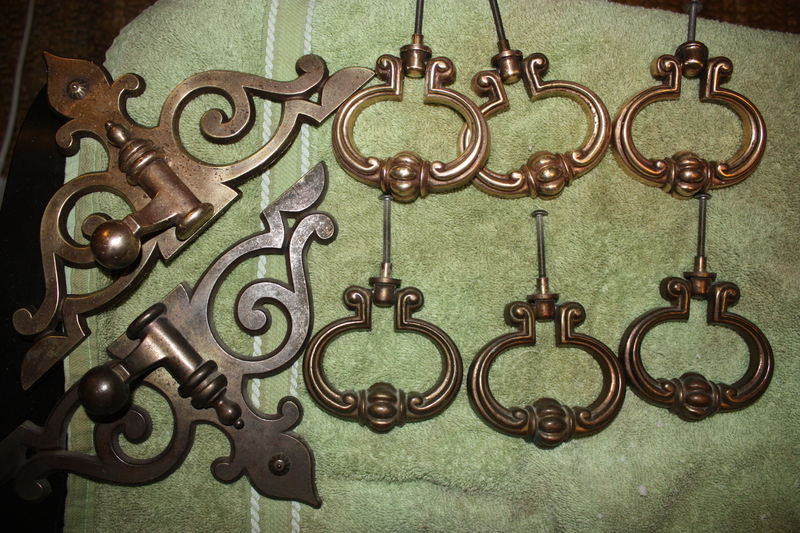 And a simple brass polishing tutorial. I have been dying to get this baby set up and photographed. It has been done for a week; I just didn’t have the time or the proper weather/lighting conditions to photograph it. If you are here for the brass polishing tutorial, it’s at the bottom! 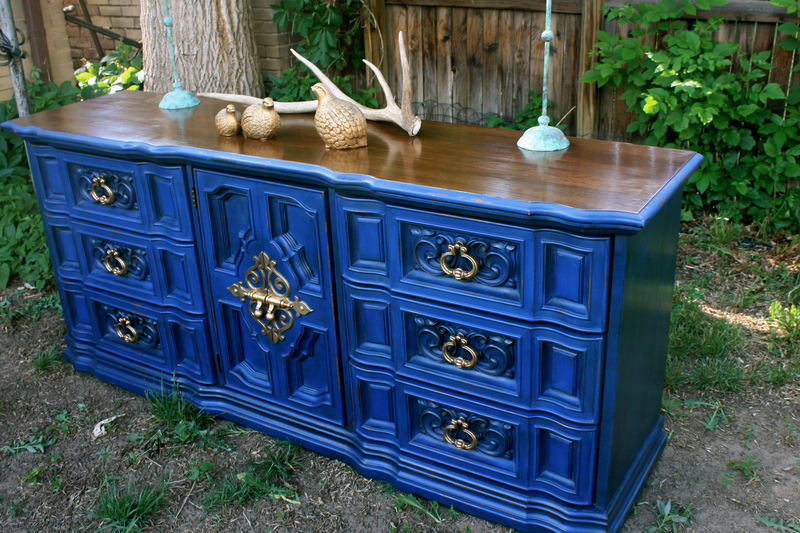 This lovely dresser was a custom order for someone who bought our mint green coffee table, The Greenwich, a while back. They wanted a bold and rich color, but didn’t know what would look best in their living room by the coffee table. They were really drawn to the emerald color that I used on The Eire and were hoping that would work. They were a bit sad when I explained to them that the emerald would clash with the mint green, but they cheered up when I started showing them some inspiration photos of navy/royal blue pieces of furniture. 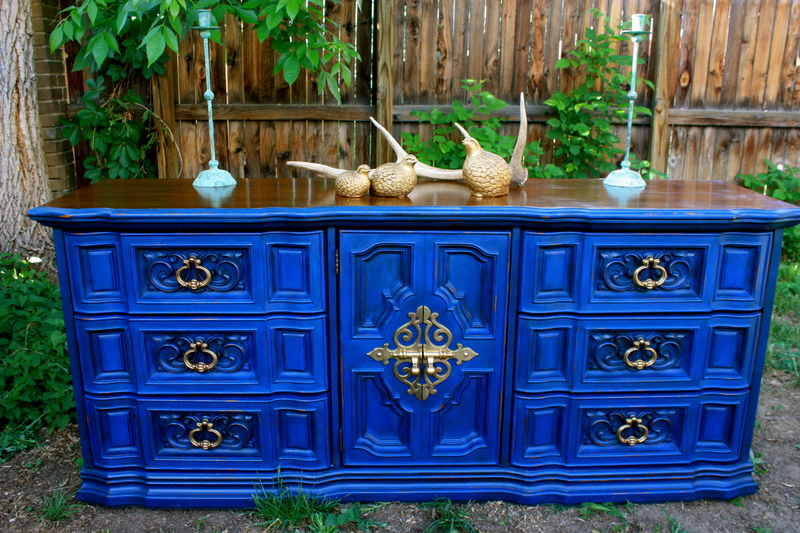 I have always wanted to work with a rich and bold blue. For some reason, though, I’ve been scared of it because I wasn’t sure of the marketability for it. No more! I LOVE LOVE LOVE this color. 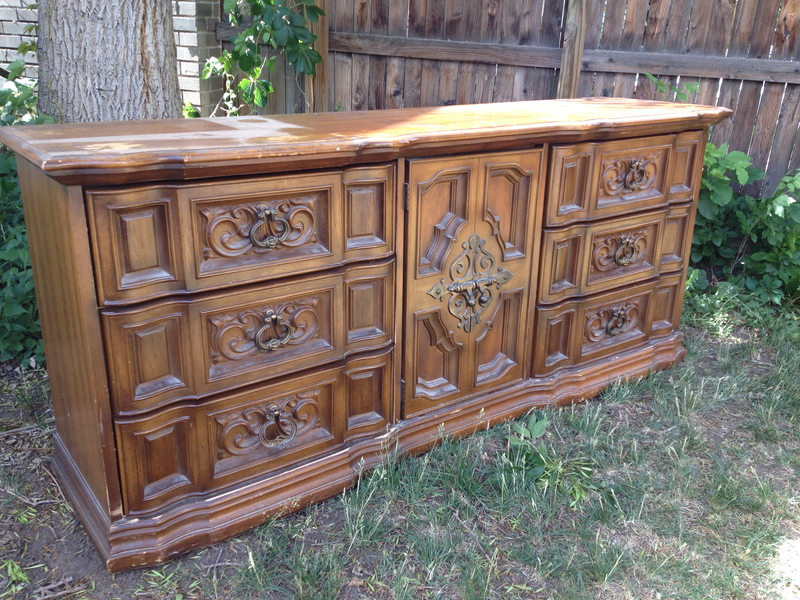 And I’m tempted to overhaul my living room in order to make a similar piece to use as my entertainment center. Annnnnnd here is what the dresser looks like now! What do you think? I think it is absolutely beautiful! 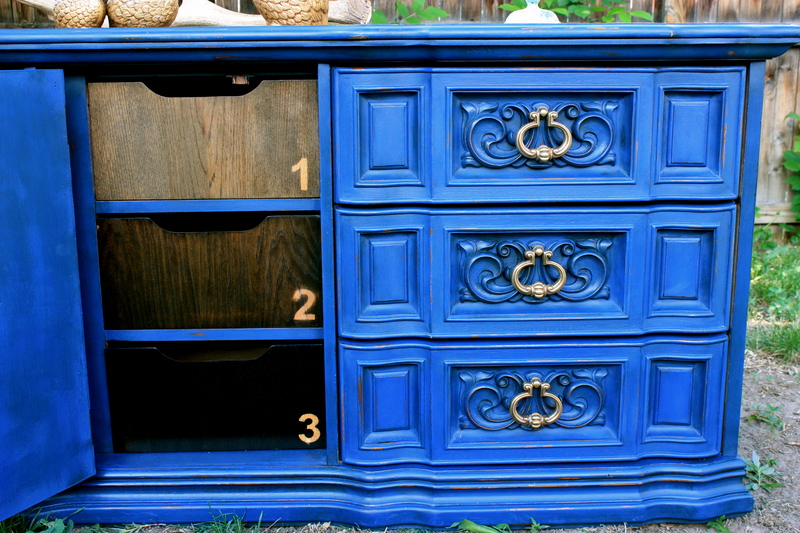 I used Annie Sloan Chalk Paint in Napoleonic blue, mixed with a bit of black in order to make it slightly deeper. 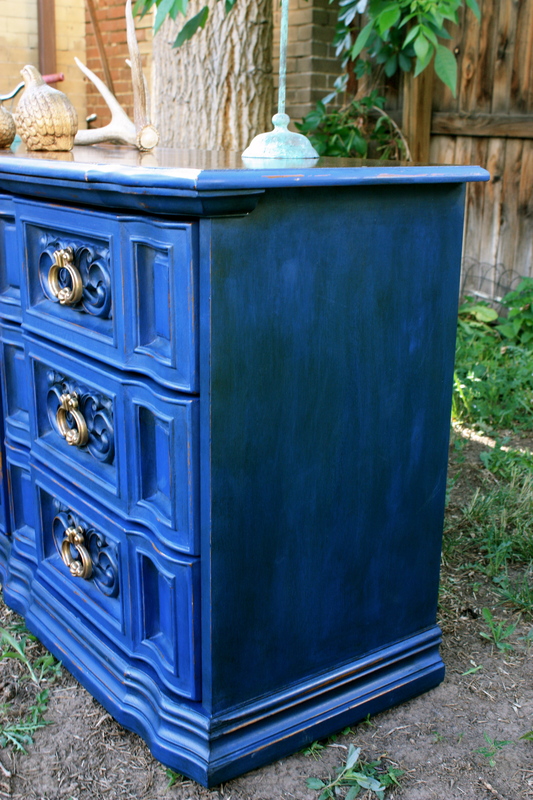 This was my first time using ASCP and while I do love the way this dresser turned out, I have mixed feelings regarding the paint. To start with, it is VERY thick. Much thicker than the latex paint I am used to working with. The benefit to this is that it covers extremely well and, true to their marketing, no sanding is required. In retrospect, I will still lightly sand any future piece I use ASCP on because, while it does stick, it comes off way too easily when distressing and that makes me nervous regarding its longevity and durability. But enough about the paint…I’ll be writing a post comparing different types of paint someday soon and will go into far more detail on my ASCP experiences. 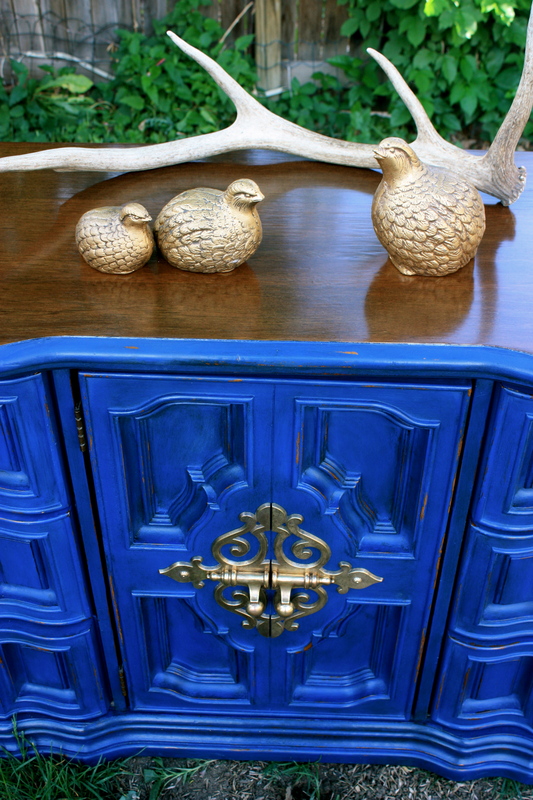 Now, as most people already know, Annie Sloan’s Chalk Paint is very chalky/velvety once it is dry. It is also very absorbent and can easily get marked up. Because of that, it is imperative to seal this paint with a top coat. 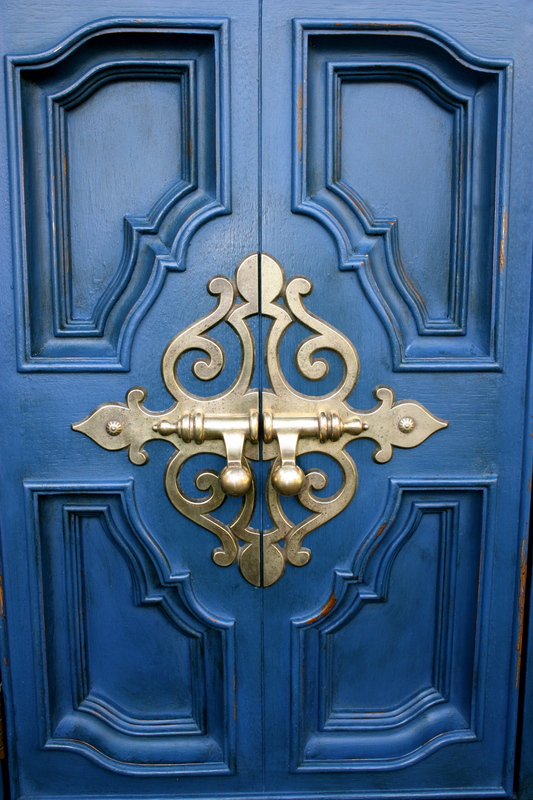 Top coat options are plentiful and it really boils down to preference. 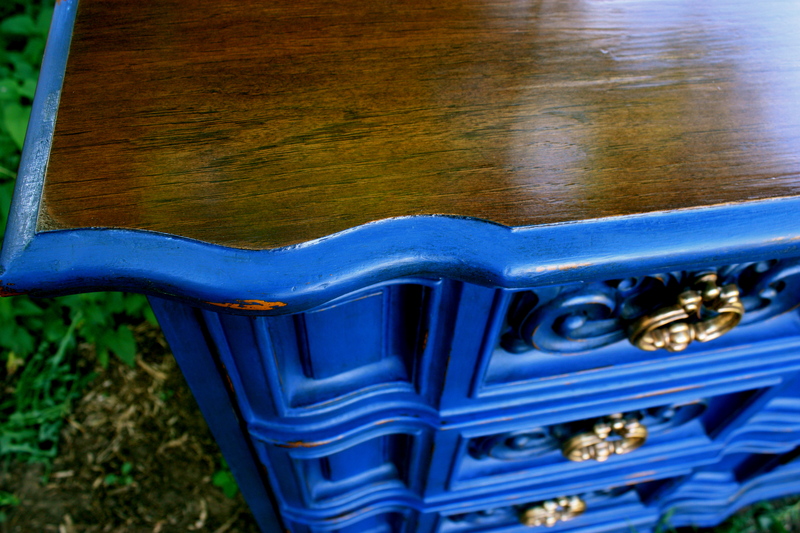 For high traffic areas, like the top of this dresser or children’s furniture, etc, I like to use polyurethane. It is nearly indestructible and does not need to be re-applied every 6 months to a year like waxes do. 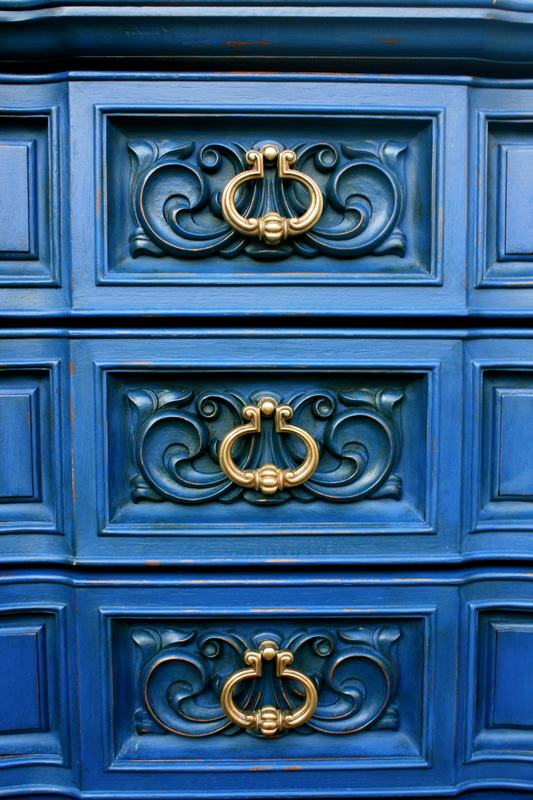 For areas that see less action, I think it’s hard to beat the beauty and lustre of a hand-buffed furniture wax. 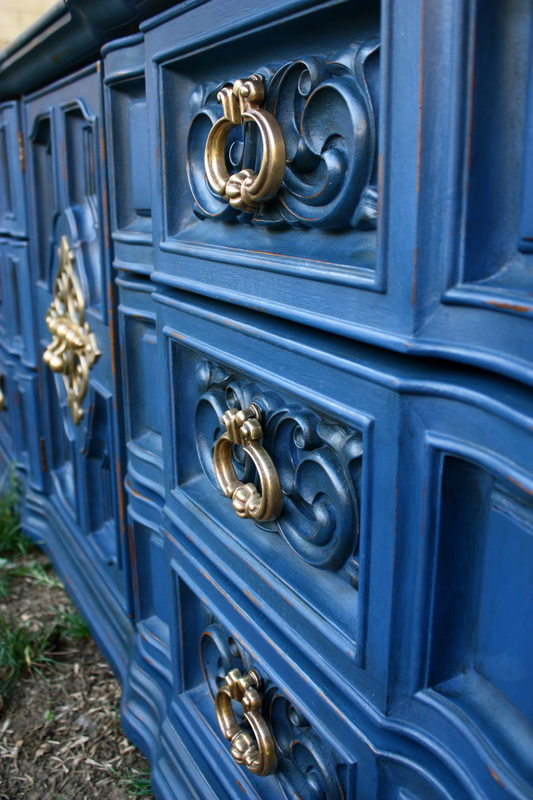 Love how the antiquing dark wax makes the details stand out! I love it. I actually find it easier to use than many of the glazes that are available and designed to achieve this same effect. What do you think of this hardware? Is that not amazing? 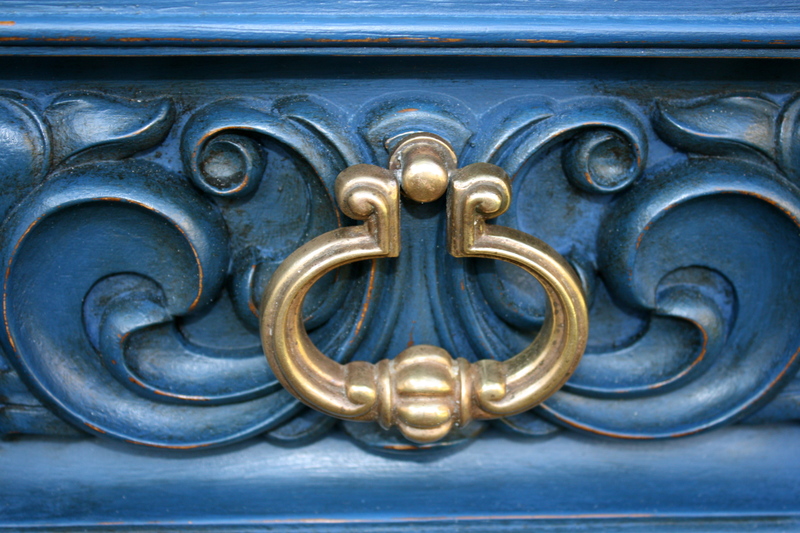 Because this wasn’t a high-end piece of furniture, I fully expected the hardware to be plastic, or at the most, brass-plated. I was thinking it was going to get the rub n’ buff treatment or the spray can treatment. But then I used my trusty magnet skills (solid brass is not magnetic) and learned that this hardware was, in fact, solid brass. Yipppeeeee! So, how do you get from the before to the after, you ask? It’s simple, just not necessarily easy. Depending on the level of tarnish, you may not need the salt. I generally start by just using lemon juice and a tooth brush. By starting here, you may be able to save yourself quite the mess! Find a well-lit space and lay down a towel to work on.Then squeeze a lemon into a small bowl, dip your toothbrush, and start scrubbing the hardware. If the tarnish comes off pretty easily, you can just continue using the toothbrush, remembering to frequently dip it into the lemon juice. The acidity in the lemon juice is the active agent that helps remove the tarnish. Take the small bowl of lemon juice and add 1-2 tablespoons of the salt. Mix it together with the spoon to create a paste. Now, use the toothbrush to spread some paste on the hardware. Next, grab your #000 steel wool and your elbow grease and start polishing! Make sure to keep the hardware ‘wet’ with lemon juice/paste. It will cut down on the amount of elbow grease you need, as well as prevent over-polishing of the hardware. Now, because salt has dehydrating power, your paste will dry out over time. Just grab another lemon and squeeze some more juice into the paste. When you have polished the brass to the level of shine that you prefer, take the damp rag and make sure (damn sure!) to remove all of the lemon juice and paste mix from the surface. Thanks for reading this far and feel free to tell me what you think by leaving a comment! Stunning color! Love the piece! Thanks Chrissie! 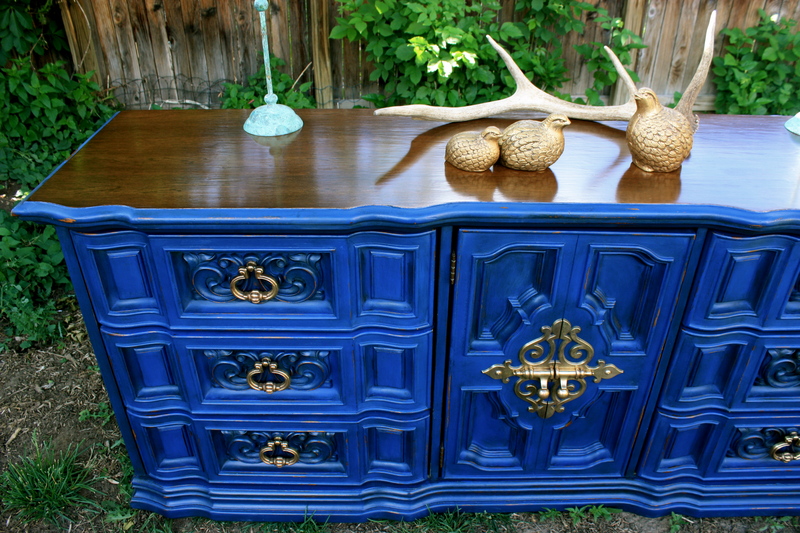 I hopped over to your blog and saw a lot of the pieces you’ve used OFMP…they are all beautiful! But I really like the yellow buffet…especially that fabric you put inside, it complements the soft yellow so well. Hi there! How do I request a piece of furniture from you?